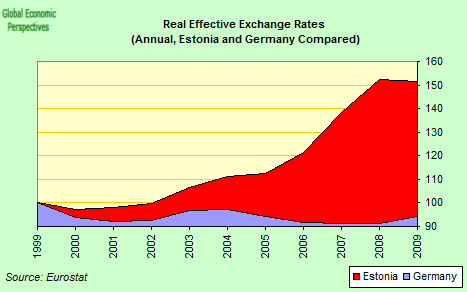 In a recent FT Op-ed, entitled “Estoniaâ€™s recovery defies economists and academics“, columnist John Dizard argued that “the â€œinternal devaluationâ€ policy, which means cuts in nominal costs such as wages and rents, was very hard on the population, but appears to have worked ahead of even the Estonian governmentâ€™s schedule”. But as I said to John in a very enjoyable phone conversation I had with him before he wrote the piece (where he was kind enough to descibe me as a “freelance economist”, one who doesn’t have to answer to a boss before expressing an opinion), perhaps we should just hold on a minute before jumping to too many conclusions, since things are still far from clear. So let’s take a look. As John points out, many macro economists, among them me myself (here, and here, and here) and Paul Krugman (here) have been arguing that if the Baltic countries stick to their policy of having a fixed exchange rate with the euro, they face a long period of low growth and serious internal deflation. At the start of this debate, I pointed out that the impact of price deflation on the bank loan books would be just the same with or without devaluation: not so, said Krugman (and he was right), the impact is worse, since even the Kroon or Lati denominated loans (which in truth are quite few) are affected. John however, does not agree, since, he tells us, the country is “stubbornly failing to comply with the predictions of what are called the ‘third generation models’ for currency crises” and “is already seeing a resumption of growth and a fall in its real cost of capital”. Well, as I told John at the time, the Estonian case is a complex one, since in a country with only just over a million people a myriad of special case factors can be at work, confounding results. 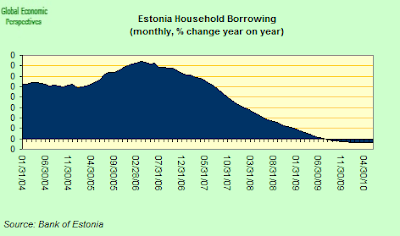 But still, the idea is abroad that Estonia is a kind of “black swan”, a data point which tends to suggest that conventional macro economic wisdom is somehow flawed. So just how valid is this view. Let’s take a look at some data. 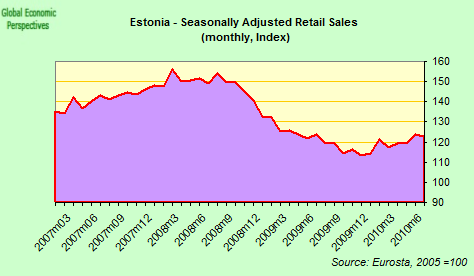 In the first place, John is undoubtedly right, economic activity has revived (slightly) in Estonia. In Q2 2010 the economy grew by a seasonally adjusted 2%, following an equivalent contraction in Q1 and growth of 2.6% in Q4 2010 (yes these are quarterly, not annual, numbers). So the first thing to say is that if these numbers are truly well adjusted seasonally (which make be hard given the boom bust background, and the amplitude of the movement in the data) what we have is a lot of volatility out there. And in the second place, we could well ask ourselves to what extent it is valid to use that so-oft maligned expression “recovery” at this point in the Estonian context. If we look at the GDP volume index (which I have put in 4 quarter moving average format), you have to look very hard indeed (go on, squint a bit more) to actually see the uptick. I tell you what, I’ll do you all a favour, and shorten the time series and change the scale. Well, that’s a bit clearer, isn’t it. I think what you can say looking at this chart is that the Estonian economy has been stabilised (no mean feat that, with an economy in freefall), but what happens next, well that, it seems to me, you can’t discern from looking at the chart. To decide on that, I think, you will probably need to go back to the initial assessment you had of the problem. 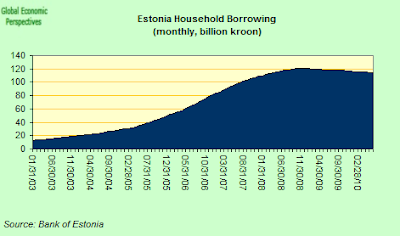 If, like John, you believed that what the Estonians were trying was doable, then you will probably draw the conclusion that what comes next will (eventually) be a recovery. 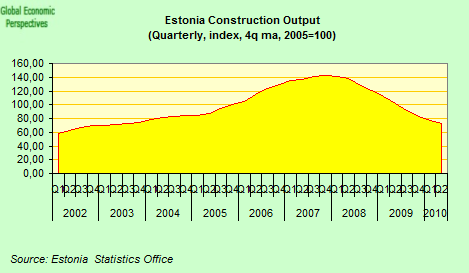 If, like me, you had severe doubts from the outset that this was doable, then you will probably imagine the Estonians are now in for a long period of slow, “L shaped” semi-recovery, with a lot of pain still to come, further down the road. But as I say, all of these expectations probably depend on your initial theoretical assumptions (more on this later), and in that sense nothing has fundamentally changed. That being said, there are some things that have improved in recent months. Retail sales for example. And then there is industrial output, which is up sharply. It even almost looks like the fist leg of one of those proverbial “Vs”. And part of the reason for this improvement in output has been the recent improvement in demand for Estonian exports. 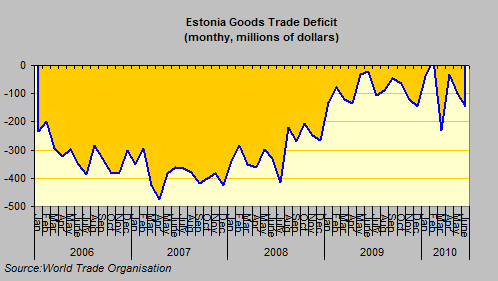 But before we get too excited about all this, we should remember that Estonia still has a goods trade deficit. That is, on balance, the net goods trade is a drag on GDP. 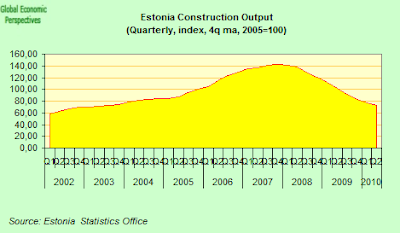 The problem is that the part of Estonian industry which was internationally competitive before the bust still is, but that this part is not large enough to drive the whole economy, now that the economy is export dependent. It just doesn’t have a big enough share in GDP to carry the whole economy. 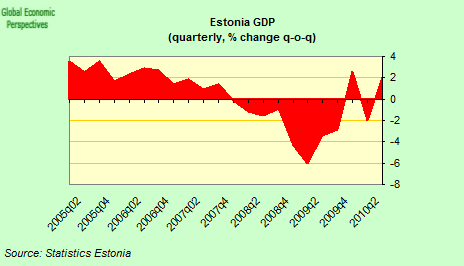 As the Estonian statistics office put it: “GDP growth in the 2nd quarter was supported by the industrial sector exports. Due to a small domestic demand, the sales of manufacturing production on the domestic market were in downtrend. In construction, the output of which is mainly targeted at the domestic market, the generated value added showed a continuous decreasing trend”. This is what I had always expected would be the case. It should be noted that Estonia runs a substantial services surplus, which at the present time easily cancels out the goods trade deficit. 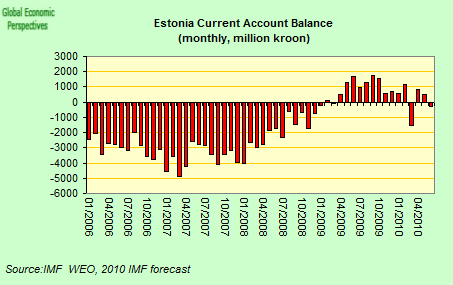 As a result, and this IS the good news, Estonia now runs a current account surplus. Which means that each month now, instead of getting more into debt, the country is steadily paying down its international liabilities. And this is important, since as John points out, Estonia is considerably less indebted externally than many other of Europe’s peripheral economies, with net external debt according to IMF data only being some 30% of GDP. But nonetheless, achieving this positive situation still has a price, and that price is that the economy is being forced to operate at well below capacity level, and the clearest indication of this is the very high continuing level of unemployment. 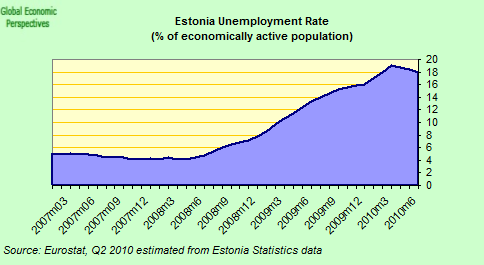 In fact, I think John got interested in his story when he read this report, that the registered unemployment rate in Estonia fell to 12% in mid-July. Since he was aware that first quarter unemployment was somewhere around 19%, this seemed to him like a dramatic drop. But there is a confusion here, since we are dealing with two different measures of unemployment, one of them people who sign at labour exchanges to register as unemployed (and may do so because they have entitlement to unemployment benefit), and those assumed to be really unemployed when measured using ILO compatible (and EU harmonised) quarterly labour force surveys, and as this article points out, according to the latest of these surveys (April – June) there were still 128,000 unemployed, or 18.6 percent of the workforce out of work in June. 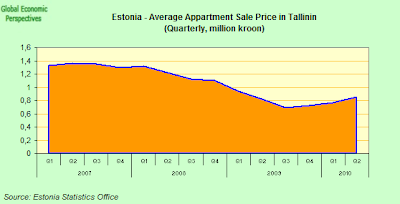 Of course, interpreting such data presents its own problems, and the issue is a complicated one, since in the first place there seems to be a large shadow economy in Estonia. According to Professor Friedrich Schneider of Austria’s Linz University, based on a study that covered 37 countries, Estonia had the second largest proportion of GDP in the informal economy, with some 40% not paying tax. Top of the list was Latvia, with shadow economy accounting for 42% of the country’s GDP, then came Estonia, Bulgaria, Turkey and Greece. So of course, not all those who are not signing the registers are necessarily unemployed, or in the country even, but still people are dropping out of the statistical system, according to the Estonian Health Insurance Fund some 20,000 less people are registered for health cover today than there were in March 2008. At the very least we can assume these people are not working in the formal economy or registering for welfare benefits. Whether they are working in the informal one, or working abroad, we really have no idea. Be that as it may, according to the Estonian Statistics Office, in the 2nd quarter of 2010 the estimated number of unemployed in Estonia was 128,000 and the unemployment rate was a – seasonally not adjusted – 18.6%. So unemployment did decrease in the quarter for the first time in nearly two years, but by 1.2% (from 19.8% in Q1), and not by the rather large amount it might appear from the labour exchange registration data. And if you go to the details of the stats office report the situation is more complex than it seems at first sight, since while the number of new unemployed has been declining, long-term unemployment continues to grow. In the 2nd quarter, 58,000 unemployed persons had been looking for a job for one year or more (long-term unemployed), of whom 19,000 had been looking for a job for two years or more (very long-term unemployed). The share of long-term unemployed among total unemployed increased to 46%, while the share of very long-term unemployed rose to 15%. The number of persons who had stopped seeking a job or discouraged persons was also larger in the 2nd quarter than in the 1st (9,000 and 7,000 respectively). On the other hand the estimated number of employed persons was 559,000, which was up by 5,000 (0.9%) over the previous quarter. According to the statistics office, “employment increased due to seasonal and other temporary jobs typical of the 2nd quarter”. Nonetheless there was employment growth, so we should be thankful for any mercy, however small. What remains to be seen is whether this improvement in employment is sustainable as Europe’s economies slow going into the second half of the year. A further bone of contention between the parties evidently concerns the so-called â€œinternal devaluationâ€ policy being applied by the Estonian government. As John Dizzard explains such a policy “means cuts in nominal costs such as wages and rents, (and) was very hard on the population, but appears to have worked ahead of even the Estonian governmentâ€™s schedule”. When we come to scrutinise the actual data however, the fall in hourly wages has hardly been dramatic, and they have now fallen about 7% from their peak at the end of 2008. But it should be remembered in 2008 they were up by around 7%, so they are now at about the same level as they were in January 2008, following increases of 17.5% in 2006 and 20% in 2007 – rates of increase which ultimately lead to the consumption bust which followed them, and clearly not sustainable in the longer term. So, unfortunately it is just not the case that Estonia has had a very harsh policy of wage cost reduction implemented. Living standards have fallen sharply, due to the reduced hours worked, and the rapid rise in unemployment – ie due to the recession – but that is not the same thing at all as recovering lost competitiveness. The Real Effective Exchange Rate data on all this is very clear. Up to 2005 the rise in living standards was more or less in line with sustainable economic growth. From 2006 onwards things really got out of hand, and to date only a very small part of the competitiveness loss has been clawed back. This intrepretation is confirmed by an inspection of the CPI data, which after 9 months of registering mild interannual deflation is now back in positive territory, and more or less a full percentage point above the Eurozone average, which for a country which is supposed to be in the throes of a substantial “internal devaluation” is pretty incredible, and could be seen as another example of someone or other falling asleep at the wheel, after passing the finishing line for Eurozone membership perhaps. John Dizzard argues that the Estonians are in position for a relatively rapid recovery (this part I don’t see at all, anywhere in the data) because they started out with much less state and private debt than the others. This latter point is certainly true, but we should not miss the fact that while Estonia’s state debt is very, very small, private sector debt (at around 100% of GDP, between households and corporates) is not so small, and indeed will continue to exert a significant downward pressure on credit growth for some time to come. Now one of the points raised by John which does have a certain validity is that of lower capital costs. Given the existence of significant quantities of land and warehouse and factory accommodation which are now surplus to requirement due to the “downsizing” which has been going on (creative destruction) employers do now have access to cheaper premisses, and this can offer them lower unit costs for a given level of technology and output. The key point to get here is where the demand is going to come from, and then we are still back with the same issue: exports. But if we come to look at the impact of this cheap credit, we will see that, as in other economies where private demand is highly leveraged (the UK, the US, Spain), the uptake on all this ultra cheap credit has not exactly been massive. In both cases the interannual rates of credit growth are still negative, which is one of the key reasons domestic demand remains so weak. Although we can see the first timid signs of recovery in the housing market, both in terms of sales volume and in terms of prices, but at this point they are just this, timid signs. So to go back to where we started, and John Dizzard’s claim that “Estoniaâ€™s recovery defies economists and academics”, I would say that rather than economists and academics (or even academic economists) who Estonia’s current situation does really defy is the group of people over at the ECB governing council headed by JÃ¼rgen Stark, since, as I reported back in April, consensus thinking at the ECB was that Estonia was not coming into the common currency , due to ongoing concerns about sustainability and competitiveness issues. But that was April, and then came May, when the ECB was forced to do a “U turn” by the crushing pressure of the European Sovereign Debt Crisis, so all these (valid in my view) concerns where simply brushed aside. And anyway, how could anyone argue for keeping Estonia out on these grounds, when you have countries like Spain and Portugal on the inside. Either internal devaluation works, or…. So maybe it was better for them to stay with the line that internal devaluation works, and whether they are right or not is what we are all about to get to see. As I said at that start the post, in this case as in so many others, beauty is in the eye of the beholder. If you believe in the neo classical (academic) theory of “steady state” growth – and the guy over at Swedbank that John cites who is forecasting that Estonian gross domestic product will grow at a 4.5 per cent rate next year evidently does – then naturally Estonia’s economy has only been temporarily knocked off its path by this whole unfortnate incident, and will soon be back in it habitual orbit. If, however, like me you suspect that neo-classical steady state growth is some sort of metaphysical hocus pocus (or what they call a “necessary assumption to get the argument going”) with little empirical support, then you will not be terribly convinced by all those numbers blindly and slavishly churned out by the current generation of models, and will look more to the facts on the ground. 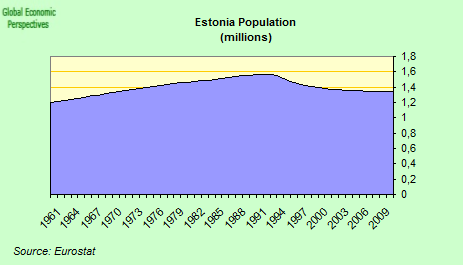 In particular, when we come to the neo classical growth theories which normally underpin the sort of optimistic analyses we see of the Estonia situation (yes John, there are academic economists on both sides), I tend to think these are flawed due to some initial erroneous assumtions Solow himself made about the impact of population dynamics on growth (see this extended argument here), and I think it is important to remember here that Estonia, along with Hungary, Latvia and Bulgaria, is one of the countries on Europe’s Eastern flank where population as well as ageing is actually falling. So I suggest you treat any analysis which talks about a steady recovery in internal demand but does not explicitly explain how this point has been taken into account……. well I suggest you treat it with more than a pinch of salt. 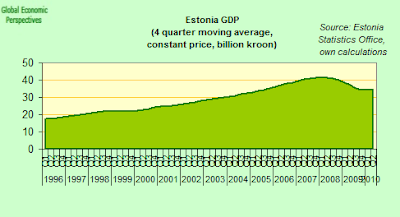 And then, of course, there is the idea of “export dependence” and ageing, and what this all means for the future trajectory of the Estonian economy. 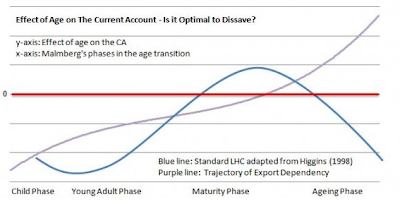 This argument, which Claus Vistesen and I have been advancing for some years now (and is one of the reasons so many of those famous “predictions” turn out to be valid), shot to the financial headlines recently when Dominic Wilson and Swarnali Ahmed of Goldman Sachs drew the obvious to everyone’s attention – namely that balance of payments current accounts are significantly driven by life cycle savings. Maybe you can argue about the validity of the age group classifiaction they use (an empirical calibration issue), but the obvious is obvious: the relative proportions of different age groups across different countries goes a long way to explaining the pattern of global savings and capital flows. 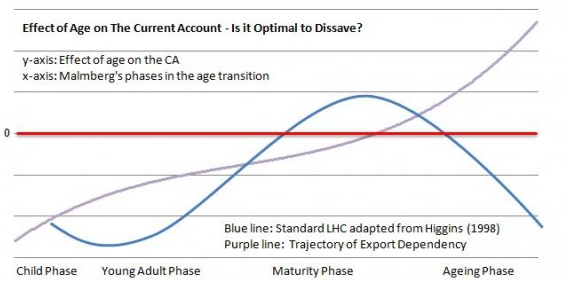 And as Claus Vistesen illustrated in the chart below, this helps us understand how societies (Germany, Japan…) become increasingly export dependent as they age. This entry was posted in A Fistful Of Euros, Economics and demography, Economics: Country briefings, Economics: Currencies by Edward Hugh. Bookmark the permalink. One couple of observations on what is a great post. Aside from areas such a construction, i have not observed much in the way of price declines which in theory should accompany an internal devaluation. One possible reason for the economies relative resilience (after a GDP decline of 18% or so) to look at is the stimulus effect of EU support. I saw a calculation somewhere (the Guardian, I think) that the EU support for 2009 was about 6.5% of GDP, and is forecast to be 8.25% for 2010. 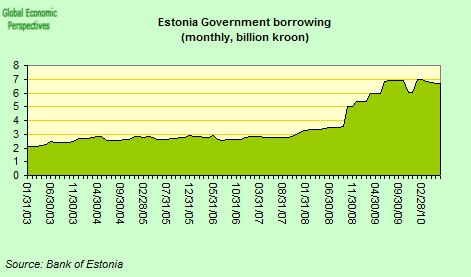 This offsets the austerity image so cultivated by the Estonian authorities (in fact much of the headcount reduction in the government came from eliminating positions they could not find a hire to fill). Another extraordinary benefit for Estonia is the increase in electricity exports that due to the closure of Ignalia in Lithuania. Finally, while wages may have come down a bit , it is easier to hire new people (especially unskilled) than during the boom, and this has helped exporting companies that often rely on this sort of labor. Anecdotally, i have heard that the lack of workers (and accompanying wage inflation) was the biggest problem for many exporters during the boom years. 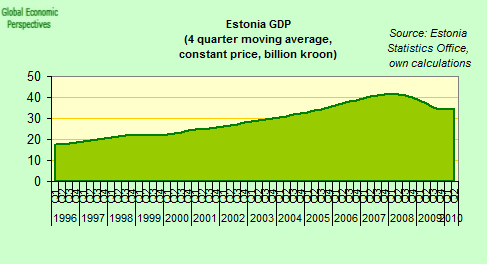 “Estonia had the second largest proportion of GDP in the informal economy, with some 40% not paying tax”. In reality this is appr. 15%. Do we have independent studies to back the 15% number up? Friedrich Schneider is an international expert in the topic, and has a methodology available for scrutiny. I have no real knowledge on this, but do suspect that – as in Spain, Latvia etc – the unemployment is not as high as it “seems”, which is not to say it isn’t a problem. 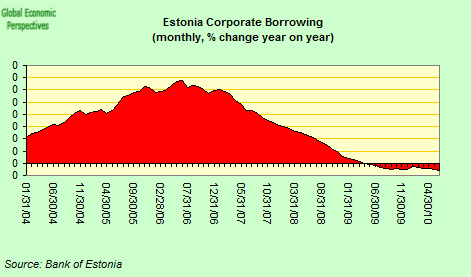 Nobody has discussed the apparently biggest competitivness shift in Baltics due to EUR depreciation. But this is the ultima ratio of the latest dynamics. 20% competitiveness increase has been very favourable to Baltics, this has strongly improved sales in markets where they compete with Poland and other CE countries. I don’t deny professor Schneider’s claim that Estonia has 40% informal economy, but I wonder what the implications of it are. 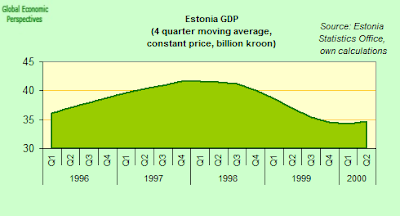 My own calculations using publicly available data show that Estonian government manages to collect some 33% of GDP in taxes while Lithuania manages just 18%,( http://vahurkoorits.blogspot.com/2010/08/estonia-is-clearly-rebounding.html ) yet Lithuanian informal economy is supposed to be smaller then in Estonia. Professor Schneider’s data may be correct, but I’m not sure about the implications. Nice and deeply thought article. I just wanted to point out one aspect, which may not be visible by just looking at the figures (at least the ones you presented). Unlike most of the ex-Soviet Union countries, Estonian labor market and economy as a whole is very deeply connected with the “west” (especially to Finland and to lesser extent Sweden). 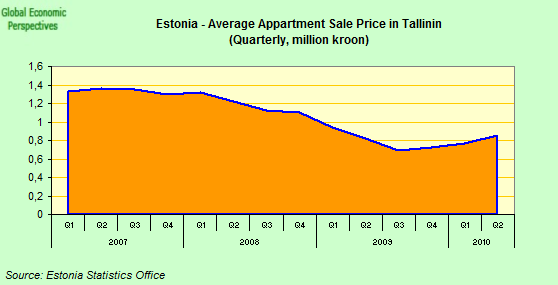 Estonian capital, Tallinn (where approx. half of the population lives) is located in less than an two hour ferryboat trip from the Helsinki (capital of Finland, approx 1 million inhabitants) and given the easiness of working abroad (no legal barriers, similar culture and language, etc.) and price differences in certain products (namely: tobacco and alcohol), there are more than 6 million trips commuted between the cities yearly (creating e.g. 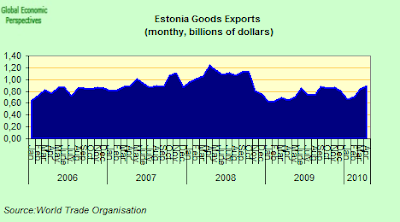 Estonian surplus for services). It also means, that a significant amount (at least in terms of income earned) of Estonian labor force is actually working in Finland, either by commuting or actually living in Finland. This _might_ partly explain the decreasing population detail (?). A lot of these people working in Finland (with higher salaries) carry the money back to Estonia which in turn inputs to country’s economy. 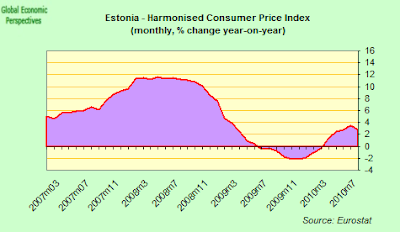 if EUR will appreciate, all the oversized Estonian competitiveness will evaporate in seconds. Estonian trade is mostly with eurozone or pegged countries so EUR rate doesn’t matter much. Hello Edward, it was guess of Estonian professor (Univ. of Tartu) U. Varblane, commenting this 40% claim. It was a while ago and I do not remember source of his data. Most probably he used result of some older research, where this number was appr 11-12% and suggested, that this should be certainly higher for now but by far not in 40% ballpark. The disease is the bubble. The challenge now is to realize what malinvestments existed. This should be easy as they will be the fastest falling! The rest of the economy, the real economy takes over, if people can be reassured as to what is happening. When economists etc say rubbish then it delays the revelation of the real economy, which is always well below the bubble, but does enable cash flow, unlike the bubble which enabled “appreciation” of a fictional kind.